Senior disabled figures in the Liberal Democrats have spoken of their frustration that the party is not set to debate key issues of concern to disabled people at its annual conference next month. Disability News Service (DNS) contacted key disabled party members after an analysis of the party’s conference agenda and directory showed there was currently not a single debate or fringe event devoted to disability-related issues. There is nothing scheduled to discuss welfare reform, the social care funding crisis, the shortage of accessible housing, the highly topical problems facing accessible public transport, or the UN’s public examination in Geneva of the UK government’s alleged breaches of the UN disability convention, which took place yesterday and today (Thursday). Although many fringe events are organised by groups unconnected to the Liberal Democrats, not one of them is set to address disability-related issues such as welfare reform, social care or access to the built environment or public transport. One motion due to be debated at the conference in Bournemouth, on encouraging companies to be “responsible corporate citizens”, mentions (in line 31 of the motion) the need for greater representation of disabled people on company boards. Another, on the recruitment, retention and welfare of armed services personnel, mentions – in line 56 – the need for better treatment of veterans’ mental ill-health. And a third motion, on the impact of Brexit on public services, points out that “nearly 100,000 non-UK EU staff work in the social care system”. These appear to be the only mentions of issues linked to disability in motions scheduled for debate. 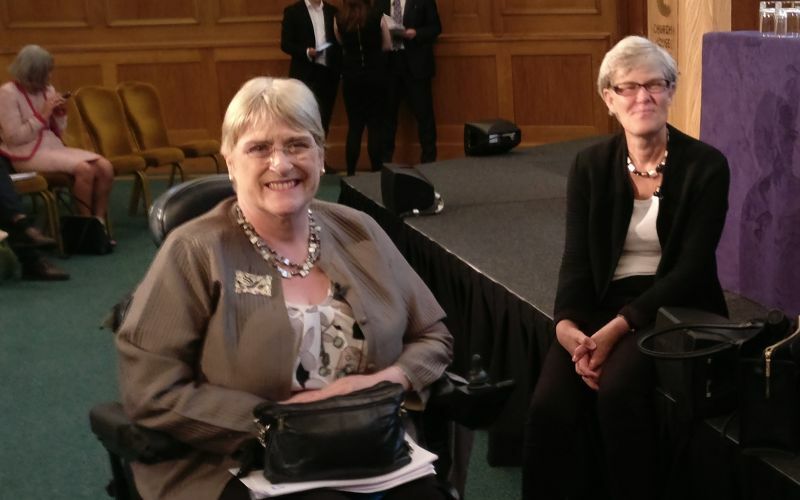 The Liberal Democrats’ disabled president, Baroness [Sal] Brinton (pictured, left), told Disability News Service (DNS) that some of the motions that will be debated at conference – including the three above – came from the party’s federal policy committee, which was “very aware of the impact of those policies on disabled people”. She said she was “hoping (no, encouraging) disabled members to speak up in those debates”, including on the motion on the impact of Brexit on public services. Other motions are submitted by party members, and she said she was “frustrated” at their failure to submit motions on disability-related topics. But she said she was hopeful that members would submit emergency motions on issues such as widespread claims of dishonest personal independence payment assessments – due to fresh evidence reported by DNS over the summer – and this week’s examination by the UN’s committee on the rights of persons with disabilities, in time for the deadline early next month. Members vote for the two emergency motions they want to debate, so she said she hoped there would be a push for a disability-related motion to be submitted – possibly by the Liberal Democrat Disability Association (LDDA) – and that members would vote for it to be chosen. Stephen Lloyd, the Liberal Democrat shadow work and pensions secretary, told DNS he was “very disappointed” to see that his party had failed to allocate time to discuss social care, welfare reform, or other issues such as accessible housing or transport. He told Disability News Service: “I was very disappointed to see the many strands around disability which are under such attack from this government not warranting serious discussion and floor time at our conference, be it as a motion deploring the cuts on a range of important issues or the shambles that is the introduction of universal credit or WRAG*. Robert Adamson, chair of the LDDA, said he was less concerned. He said: “Our conference decides policy that remains in place until it is changed by replacement policy. And he said the conference needed to debate issues “that are important to all citizens (and in the Lib Dems that word ‘all’ does include people with disabilities and all other diversity groups)”. He added: “I use a wheelchair but the natural environment is important to me; as is climate change; as are public services and the impact of Brexit; as are safe building standards; as is defeating terrorism; as is knife crime and as is employment.